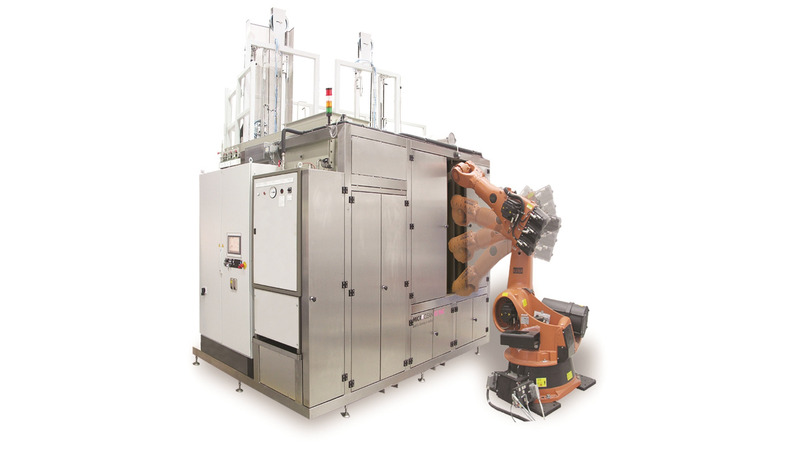 This robot-based SLE high pressure cleaning system is perfect for the deburring and the targeted cleaning of complex components as for example die-cast housings. The parts are time-fed into the cleaning cell by the reversing table. While the cleaning or the deburring procedure takes place in the inside the system can already be re-loaded. This guarantees the optimum exploitation of the system. Due to various interfaces loading can be carried out either manually or automatically. Different as well as difficult component geometries can be cleaned and deburred reliably thanks to the variable component handling. In combination with further cleaning and bath treatment processes also an ultra-fine cleaning of parts is possible.